1From File Explorer, tap the Home tab near the top-left corner. The Ribbon changes to show the icons. 2Tap the Move To or the Copy To icon. A menu drops down from your tapped icon, listing locations where you’ve previously saved items. 3If you spot your destination, tap it to complete the process. If you don’t see your location, choose the entry at the list’s bottom: Choose Location. 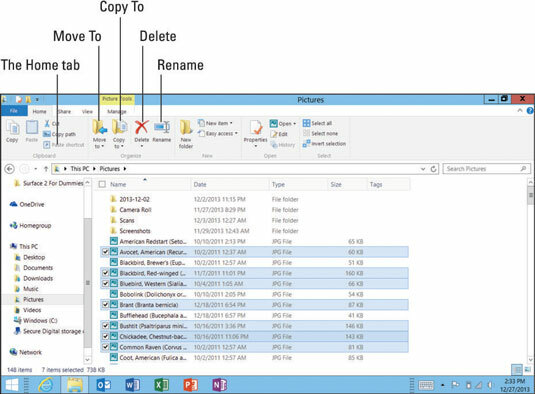 The Copy Items or Move Items window appears for you to choose the destination for your selected files. 4Select the destination from the window and then tap the Copy or Move icon to send your items to their new destination. 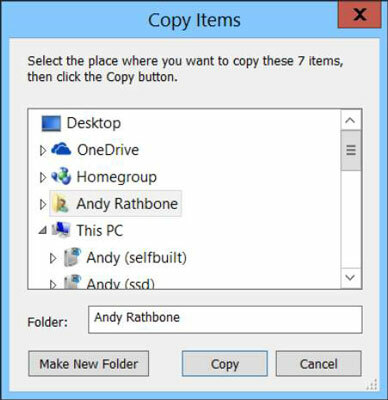 The Copy Items dialog box works much like a tiny Navigation pane that you see along the left edge of every folder. Tap Libraries to send your items to your Documents, Music, Pictures or Videos libraries, for example. Or, to send items to a flash drive, tap your flash drive from the drives listed in the window’s Computer section. You can enlarge the Copy/Move dialog box by dragging its bottom-right corner outward with your finger. That brings more items into view.